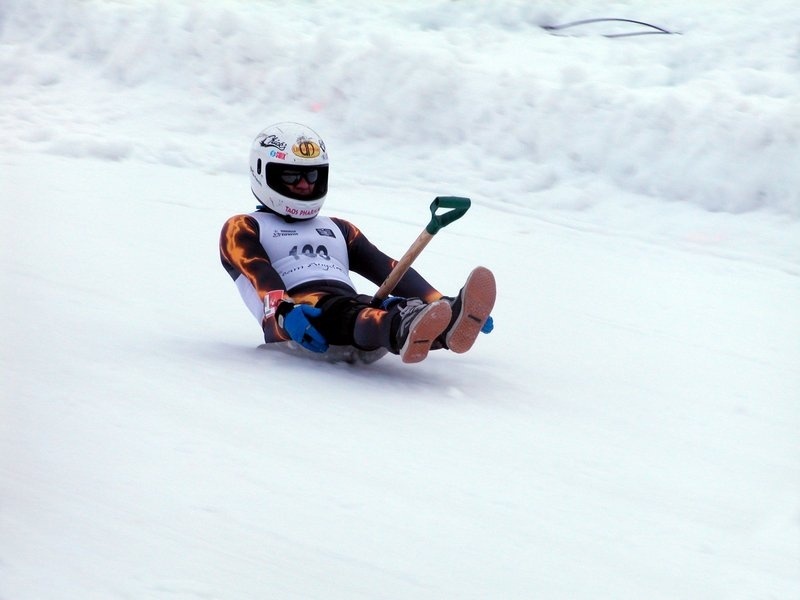 Angel Fire, NM – A taste of Louisiana is coming to Angel Fire Resort as competitors of all ages are once again waxing up their snow shovels for the legendary Angel Fire Shovel Race Championship happening over Mardi Gras Weekend, this Friday and Saturday. The challenge is fairly simple: competitors sit on the scoop of a standard aluminum snow shovel, handle pointed downhill, and then lift their hands and feet to allow gravity to take them for a ride. Each rider gets two shots to clock the fastest time down the front of the Angel Fire ski mountain. Top speeds regularly exceed 60 miles per hour. The organized competition has been held for over 30 years at Angel Fire Resort, and racers are expected from all corners of the country. The event has even been featured by national news outlets including ESPN, ABC Sports, MTV and The Travel Channel. Shovel racing was also once a featured sport during the early years of the Winter X Games. This year the event will include a Women in Media Shovel Race Competition – where Women in New Mexico television and print media will compete for bragging rights and the fastest time down the hill on a shovel. Children as young as age 6 are invited to participate in the “Little Scoop” race category. Cash and prizes will be given to the fastest competitors in all age-specific categories. The weekend events will include a practice course, Mardi Gras themed food and drink specials and live music. This year The Shovel Races falls on Mardi Gras Weekend, so Angel Fire Resort will offer family friendly Mardi Gras style celebration including; Gumbo and King Cake dinners and live Cajun band entertainment.